While the majority of metal festivals today have an ‘extreme’ stage, or at least a smattering of darker, nastier acts polluting their lineup, straight-up black metal festivals remain very much in the underground. A select few (such as Slovakia’s Gothoom, Finland’s Steelfest or Norway’s now-defunct Hole in the Sky) enjoy better press than others, but one that stays sadly overlooked must be Belgium’s Thronefest . 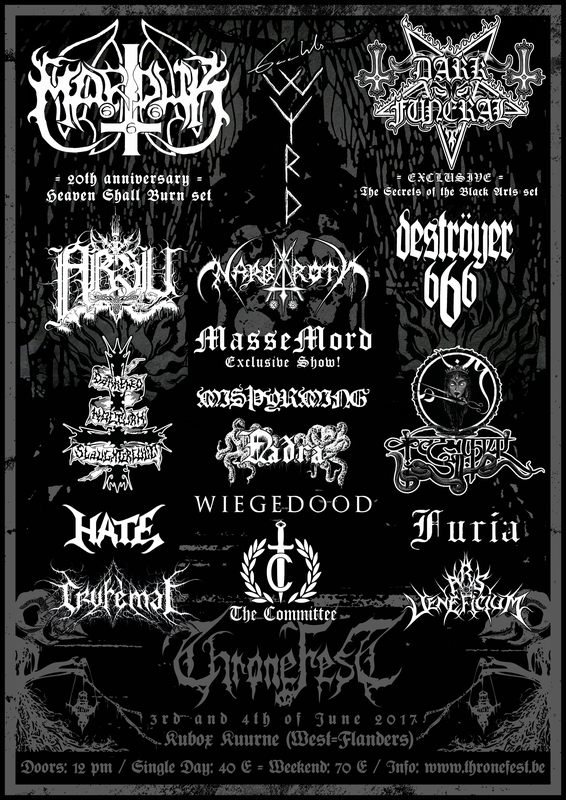 Next year will see the ten-year anniversary of this small, but powerful black metal festival that has in the past seen such heavy-hitters as Gorgoroth, Carpathian Forest, Belphegor and Archgoat playing in the tiny Belgian town of Kuurne. 2017 was no different, featuring headline shows from Nargaroth, Absu, Hate, Marduk, Dark Funeral and Gaahls Wyrd spread over only two days, which made for an intense experience. Things started slowly on the Saturday afternoon, as local lads Ars Veneficium laid out a solid set that was quite Finnish in style, with obvious influences from Sargeist and Satanic Warmaster shining through. Spain’s Cryfemal (a one-man act with session musicians brought in for live shows) followed this with a harsher, rawer set, before Iceland’s Naðra  took the stage: never before in my experience have such a grimy collection of hippies delivered such a stellar selection of bleak atmospheres. 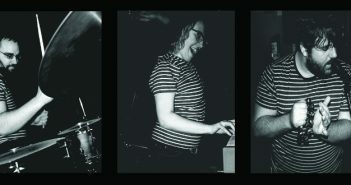 Excellent musicianship delivered with aplomb. Having hardly recovered from this, Furia (the band that rose from the ashes of Poland’s Massemord) made good on their name, with 45 minutes of pure blackened fury. Hot on their heels began an incredible headline lineup; Hate, Absu and Nargaroth played the last shows of their current European tour. While each band was excellent in its own right, I do have to question how Texas’ Absu ended up on the same lineup – Hate’s near-perfect musicianship was tighter than a sparrow’s cloaca, and appropriately riddled with scorn and misanthropy despite their death metal roots, Nargaroth’s incandescent (my T-shirt from that night still has stubborn paraffin stains from the firebreathing) performance proved beyond any doubt that their take on black metal ist immer noch Krieg, but Absu’s raw, thrashy and overall upbeat interpretation of “mythological occult metal” seemed a bit out of place. This is not to imply that they were bad – the vocalist starting as drummer, then leaping out from behind the kit a few numbers in; the frenzied guitar work; the Venom-esque outfits – all came together in a delightfully heady brew, just not a very black one. Ditto for Deströyer666, who seem to have left their blackened roots far behind to opt for a more thrash-oriented sound. Marduk, however, summarily returned the tone of things to the fuliginous end of the spectrum with a superlative, energetic rendition of their Heaven Shall Burn… When We Are Gathered album. A ferocious end to the day, but the stand-out performance for Saturday must have been Ash’s impassioned performance on Nargaroth’s closing number, a cover of Burzum’s ‘War’. Day one had set the bar pretty high, but Sunday lived up to – even surpassed – any expectations. 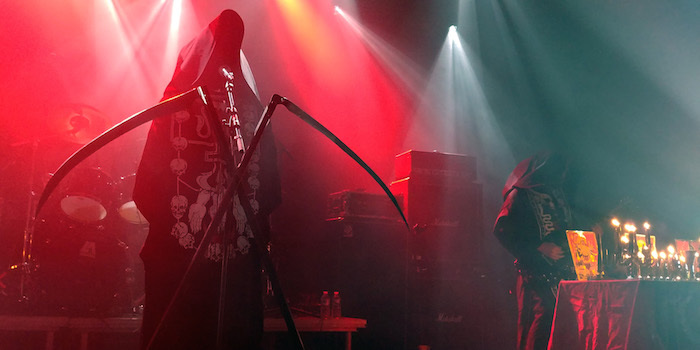 The Committee (an international act that exists behind pseudonyms, assigned personalities and masks, much like Ghost’s Nameless Ghouls) tore the small indoor venue apart with atmospheric black metal in the vein of Mgła. Darkened Nocturn Slaughtercult unfortunately pulled out of the festival at the last minute due to their drummer being injured, but another local act, Alkerdeel took their place and rapidly became one of my new favourite discoveries: combining post-black melodies with sludgy, droning bass work and borderline industrial rhythms, this is one act worth taking note of for the future. They were followed by another homegrown act, Wiegedood, who take the Norwegian trope of two-chord bases for bleakness as far as possible in wringing out aching, melancholic compositions. Powerful stuff, but unfortunately nothing new, despite a tight, well-rehearsed performance. And then there was MisÞyrming. While it seemed at first to be a rerun of Saturday’s Naðra show (the bands share members) the differences became swiftly apparent, with a far harsher, more energised setlist that owed more to long-running Icelandic acts like Svartidauði than more contemporary post-black acts. Their show was proof positive that the up-and-coming Icelandic black metal scene is a force to be reckoned with . Another déjà vu moment then happened as Furia returned to the stage – but as their previous incarnation, Massemord, for a special one-off show, and one of the most confrontational acts of aggression of the weekend, beautifully rendered in tones of misanthropy, blastbeats and antagonistic screams. The Czech Vedic black metal band Cult of Fire were next and, while I make no secret of my own fanboy status where they are concerned, I was very impressed to see just how popular they were with the crowd: people queued for their merchandise before it was unpacked, the venue was rammed and their theatrical, ritualistic show was beautifully presented to a screaming audience. Truly an unforgettable, ritualistic experience and possibly one of the most exciting live acts currently touring. There was hardly time to recover before my personal highlight of the weekend, though: Gaahls Wyrd delivered a varied set of Trelldom, God Seed and Gorgoroth songs that highlighted this legendary frontman’s vocal abilities – whether chanting, screaming, growling or singing clean passages, he remains a master of his craft . Guest appearances by Kati Ran (on vocals and nyckelharpa) and Luca Gregori (of Darkend) made for an exciting, diverse show. 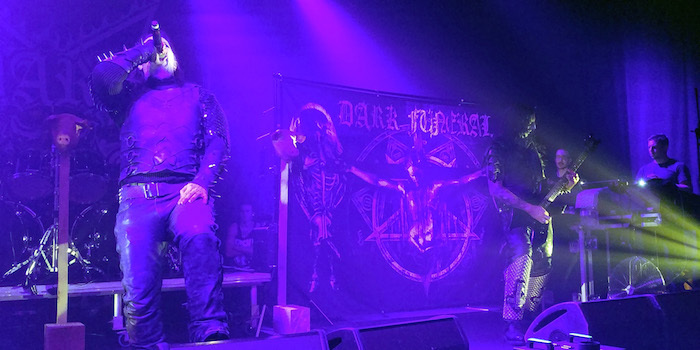 The final act of the festival was another Swedish classic – Dark Funeral playing their 1996 Secrets of the Black Arts album in full – followed up with encores from their latest release, Where Shadows Forever Reign. I have the utmost respect for this band and their unswerving dedication to a manifesto they signed in blood in the early 90s, to deliver uncompromising Satanic black metal (even though guitarist Lord Ahriman is the only original band member left! ), replete with pyrotechnics, leather and chain mail, even during an unseasonably hot summer in Belgium. 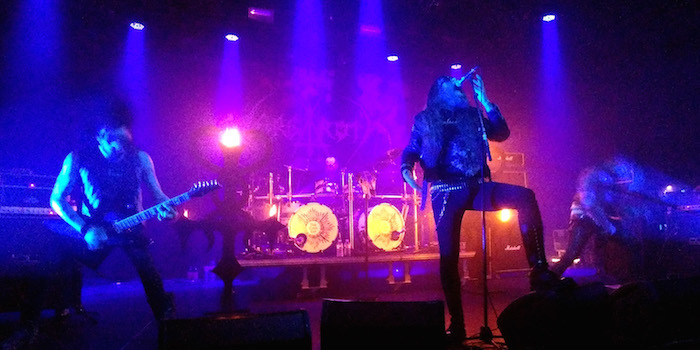 Consummate performers, every one of them – and new vocalist Heljarmadr more than proved his worth as a successor to Emperor Magus Caligula. In all, there was nothing Thronefest failed to deliver on: excellent bands, brilliant sound, fast setup between acts, well-stocked merch stores… All in all, the only drawback was the pricey drinks at the bar – and even that would have been no problem if I wasn’t travelling on a weak South African currency. I am sorely tempted to start saving now for next year and whatever the organisers pull out of their hats for the ten-year celebration. All photos to be credited to Nic van der Merwe. Josh Lee’s review of their Allir Vegir Til Glötunar album can be read here. As discussed at length on Broken Amp’s Smash The Mic Episode 3. I don’t know if it is my own dissatisfaction with the world finding solace in kindred spirits, but both Gaahl and Ash, while putting their all into their performances, come across as extremely unhappy individuals who would rather be somewhere else, somewhere with fewer humans. Both frontmen had moments during their sets where they stare into space with heartbreaking loneliness that further deepens my appreciation for the music they create.